What's the use of a penny in today's economy? The U.S. government has been talking about doing away with the copper-plated coin for years, but so far, no progress has been made. Two big arguments against keeping the coin in production are time and cost. In 2016, the U.S. Mint spent 1.5 cents to produce each one, making the cost of every penny 50 percent higher than its actual value. They also waste a lot of time. 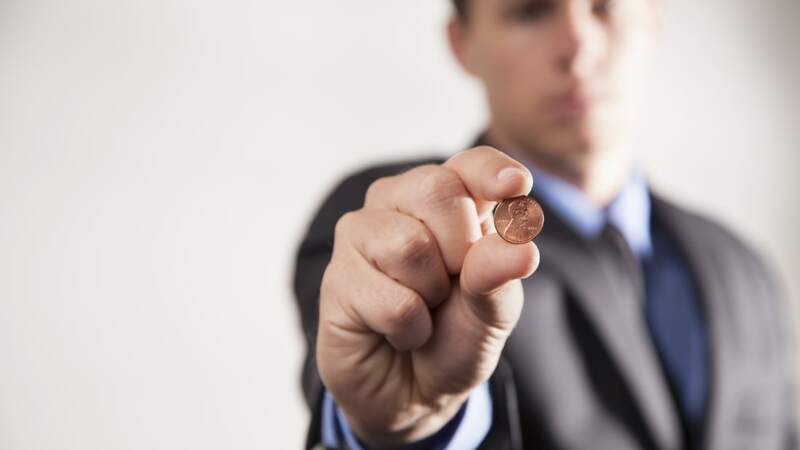 Citizens to Retire the U.S. Penny claims that handling pennies adds an average of two seconds to a cash transaction. According to a 2012 study by the Federal Reserve, there are 107 billion cash transactions per year in the United States. To help you combat the penny problem, here are some strategies for spending them, plus ways to put them to creative use. 1. DEPOSIT THEM AT THE BANK. If you don't want your pennies, your bank will take them. Count them out, roll them in coin wrappers (ask your bank if they can give you some for free), and deposit them into your account. There are a few banks that will count coins for free and exchange them for bills so you can walk away with cold, hard cash. You can find participating institutions listed on Lifehacker and MyBankTracker. 2. TAKE THEM TO A COINSTAR MACHINE. Coinstar machines are magical: You dump your jar of change into their depths and get cash in return. The major downside is that there's an 11.9 percent service fee. However, if you choose the eGift Card option, there's no fee. Options include Amazon, Starbucks, Sephora, iTunes, and Best Buy. Or, turn your coins into a tax-deductible donation to one of several charities. You can use Coinstar's website to find a machine near you. 3. MAKE A COLD COMPRESS. 4. CREATE DIY DRAPERY WEIGHTS. If your curtains flare out and won't stay straight, use pennies as drapery weights. Open the stitching at the bottom of your drapes and slide a few pennies in, then sew it back up. 5. SEPARATE THEM INTO DENOMINATIONS BEFOREHAND TO MAKE SHOPPING EASY. Organize your pennies into groups of five or 10 and put them into small Ziploc bags to keep in your purse or backpack. Then you can combine them to pay for something that calls for, say, 15 cents in change. Or, if your total comes to an amount that's not a multiple of five or 10, breaking open a baggie is easier than scrounging around in your coin purse. If you have lots of pennies, use them for floor tiling. If you're feeling especially ambitious, try a pattern. The internet is full of stunning examples of penny flooring. 7. … OR MAKE A PENNY TABLE. Add a copper top to a plain table with this DIY guide. 8. USE TAKE A PENNY, LEAVE A PENNY JARS. Take a penny, leave a penny trays are everywhere—but many people don't understand how they work. They're commonly seen at convenience stores or other small shops. Here's the rundown: Customers can take pennies from the bowl if they don't have change and don't want to break a bill. If you get pennies as part of your change for a transaction, you can get rid of them there, so they never even touch your wallet in the first place. There are plenty of DIY penny jewelry ideas out there, including a bracelet, a lucky penny necklace, and a bejeweled ring. You can also make some hand-stamped bling like this pendant. 10. FUNNEL YOUR PENNIES INTO HOME DECOR. There are endless ways to turn pennies into statement pieces for your pad. Paint them white to make this crafty vase, make them into coasters, decorate a mirror or a picture frame. Make some creative wall art, like this penny mosaic portrait of Abraham Lincoln, these block letters, or this ombré wall hanging. Or, find pennies from milestone years in your life and make a commemorative piece like this one.